At the beginning of the 18th century, long before the term “allergy” was created by Clemens von Pirquet, mold exposure was recognized as a potential cause of harmful respiratory symptoms. In 1726, Sir Floyer reported a severe asthma attack for the first time in a patient who had visited a wine storage where must was fermenting. More than 100 years later, Blackley described bronchial catarrh and chest tightness after inhalation of mold spores. In 1924, Storm van Leeuwen suggested that inhaled mold spores could cause asthma. Now, data from several epidemiological studies provide evidence for the important role of mold in respiratory diseases in the indoors as well as in the outdoors. The results of a study on 5700 patients from 1963 to 1977 showed 11.5% of those patients were positive to dermal test and were sensitive to mold spores (1). 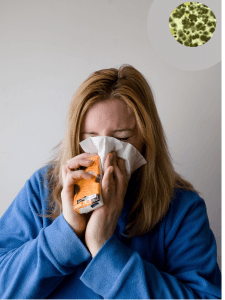 Based on a new study in 2015, mold can act as indoor and outdoor respiratory allergen source and 5% to 20% of individuals attending allergy clinics are sensitive to mold. Mold sensitization is not only found more often in patients with asthma but also may represent a risk factor for development of asthma in healthy people. Moldy odor, home dampness and visible mold growth have been associated with the development of asthma and the severity of respiratory symptoms in children (2). Indoor exposure to mold was further found to be a risk factor for the prevalence of coughing and asthma. If you have a mold allergy, your immune system is sensitive to mold and overreacts when you breathe in mold spores. A mold allergy can make you cough, sneezing, itchy or red eyes, rhinitis, runny nose, hives, difficulty breathing and asthma. The most common symptoms related to mold exposure are allergic reactions. But some other symptoms are associated with mold exposure. Some of hese symptoms are fatigue, headaches, joint pain, muscle cramps, light sensitivity, numbness, diarrhea, memory issues, confusion, mood swings, night sweats, metallic taste in mouth, vertigo, skin sensitivity, excessive thirst and insomnia. (1) : Clinical and statistical study on the allergy of type 1 to mycetes. Ann Sclavo. 1979 Jan Feb; 21 (1) : 100-7.